When you are working at home, there are two complementary services you can use to leverage your UDelNet ID to gain access to resources. VPN server allows you access to internal UD hosts with a private address, while the proxy server allows you access to external Web servers with a public UD address. Use one at a time but not both together. Your home laptop is assigned an IP number from the pool available to your ISP. 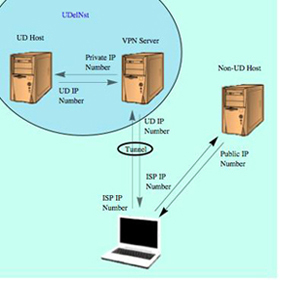 To use the VPN server on the UDelNet private network, you must configure your VPN client with the UD VPN server information, and every time you connect, you must supply your UDelNet ID/password. This connection establishes a tunnel that is encrypted to keep the data private. All connections to UD hosts are relayed through the tunnel to the VPN server, and the UD host sees the Private IP Number and grants you access, knowing your connection is secure all the way back to your laptop. When you connect to a Non-UD host, the tunnel is not used, and you are connected directly to the Host using your ISP IP number. This is just as it would be if you were not using the VPN client. This is called split tunneling. The VPN Server is always looking inward to UDelNet internal hosts; it never connects to the outside on your behalf. The university has agreements with many non-UD Web services to give UD users access to their collections of data. This access is granted based on their service seeing a connection from a UD IP number. If you connect directly from your home laptop, the service will see your ISP IP number and either deny access or request that you pay for the data. 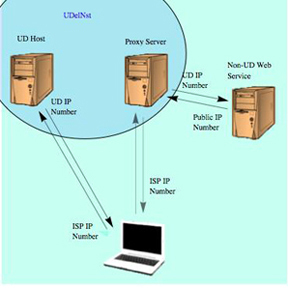 The solution is to connect to the non-UD Web server through the UDelNet proxy server. To use the proxy server, you must supply your UDelNet ID/password, and all Web traffic is relayed back to your laptop through the proxy server. Connections to other hosts are done directly. The proxy server can only connect to known Web servers, and this is usually easiest to do through the library database service. The proxy server always connects with a 128.175 UD IP number as required by the non-UD Web services. Use this to gain access to the data from home as if you were on campus. Use the VPN server when you are connecting to an internal UDelNet server and need a private 10.7 address. Use a proxy server when you are connecting to an outside Web host and need a public 128.175 IP address. You must disconnect the VPN server to use the proxy server, and you should logout from the proxy server before you reconnect to the VPN server. See VPN and Proxy servers for a detailed description for using both from home.